From Manizales, we caught a bus to the pueblo of Salento (pop. 3000), on the other side of Parque Nacional Los Nevados. The small town feel was a nice change, Salento is a place where people actually said hello to each other on the street: I tipped my hat and offered "buenos tardes señor" to an elderly gentleman and he responded with "que caballero" and a smile. 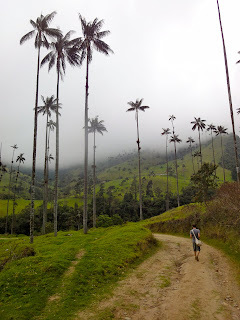 The only way to reach Valle de Cocora National Park is via Jeep, which they gladly run with the "pack as many as you can" rule; people hanging off the sides, wherever you can get a handhold. After a dusty ride and a short walk, we found ourselves in the midst of hundreds of wax palms, Colombias national tree. In addition to growing nearly 60 meters tall, these palms were set against a surreal-looking backdrop of rolling green hills (which Brent remarked, looked like something from DragonBall Z or Sonic). Before trekking in Colombia, I had no idea how many hues of green Mother Nature was capable of reproducing to paint a palette of amazing natural beauty. 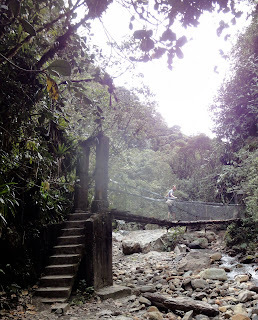 As we hiked further up the valley, the terrain changed from grassland and wax palm to denser jungle and cloud forest. We began to encounter man-made development, long abandoned to the clutches of the jungle. As we crossed makeshift bridges over roaring rivers, I felt like the next turn could bring out blow-darting jungle pygmies a la Raiders of the Lost Ark. We came across a suspension bridge that scratched Brent up as he tried to avoid the broken slats below. We were also reminded of the rebel FARC presence that had prevented tourism in this park only a few years before; there were certainly enough jungle tunnels that we saw to reinforced this fact. Though there had been FARC activity on the other side of the mountain as recently as last year, we felt safe, knowing the Colombian Military checkpoints we had driven by earlier would do everything they could to hold the line. A few more miles up steep terrain and we came across the Reserva Natual Acaime. 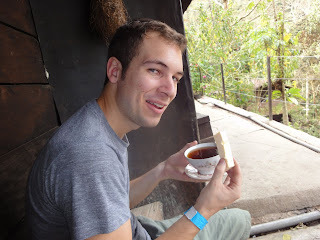 The caretaker chatted with us about the eating habits of the Andean Bear as we sipped Aguapanela (chocolatey tea) with chunks of freshly-made cheese and watched the hummingbirds buzz around the air.